Advanced Weighing Indicator R320-K35ZF Associates Co.
A new range of firmware is now available on the R320 hardware offering increased flexibility for application selection. 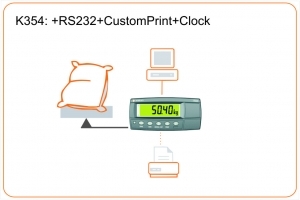 Specifically the K35* range of firmware offers a clock calendar, RS232 serial communications and custom printing. The built in RS232 communications port is 15kV static protected. The Advanced Weighing Indicator R320-K35 is ideal for applications that require connection to a printer with a requirement for custom printing formats including date and time. K356 Set Points: The K356 firmware additionally includes two Isolated set point outputs. These are high side driver up to 300mA, allowing direct connection to PLCs and for external actuators to be driven directly. rinLINK magnetically coupled link on front fascia for easy access in situ for updates/setup of the indicator, saving the installer time and effort. 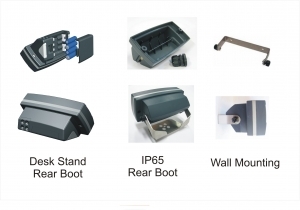 Wall mounting bracket to work with desk stand or rear boot. The following files are available for download for the Advanced Weighing Indicator R320-K35. Ensure you select the correct documentation for your unit’s software version. Check back regularly for software and other updates.